California’s biggest utility succumbs to tens of billions of dollars in wildfire liabilities. Total insured losses from California’s major wildfires last year now stand at $12.4 billion. Pacific Gas & Electric, overwhelmed by tens of billions of dollars of potential wildfire liabilities, officially filed for Chapter 11 bankruptcy protection on Tuesday, opening what could be a years-long effort to reorganize the state’s largest utility. PG&E’s filing with the U.S. Bankruptcy Court of Northern California listed assets of $71.39 billion and liabilities of $51.69 billion, including the estimated $30 billion in liabilities it faces from wildfires in 2017 and 2018. These include the Tubbs Fire in October 2017, other fires in its territory that year, and the Camp Fire in November 2018. These liabilities dwarf PG&E’s roughly $1.5 billion in liability insurance coverage, and are nearly seven times its current market capitalization of $7.5 billion as of Tuesday morning. PG&E has seen its share price fall to roughly one-sixth its former value over the past 15 months, and its credit rating has been downgraded to junk status in the past two months, based on its exposure to liability for the multibillion-dollar damages caused by these fires. This week, investigators with the California Department of Forestry and Fire Protection cleared PG&E of responsibility for starting the Tubbs Fire, slashing the estimated $15 billion in damages from that fire from its list of liabilities. But Cal Fire did find last year that PG&E lines were the cause of several fires that killed at least 15 people and razed over 5,000 homes in the fall of 2017, including 12 cases where the utility was allegedly in violation of safety or maintenance procedures. As for the Camp Fire, where losses may exceed $16 billion according to Munich Re, Cal Fire investigators have not yet found a cause. But a PG&E transmission line equipment failure has been linked to the start of the fire, as has the utility’s decision not to pre-emptively shut off power to the region’s grid as a fire prevention measure, despite high-risk weather conditions in the days before the fire started. Total insured losses from California’s major wildfires last year now stand at $12.4 billion, California Insurance Commissioner Ricardo Lara said in a Monday press conference. That includes $8.4 billion in claims from the Camp Fire, an additional $3 billion from other fires in November, and $935 million from the Carr Fire and Mendocino Complex fires in Northern California. Last year’s wildfire bill, SB 901, does allow PG&E to pass on the costs of wildfires in 2017 and earlier to ratepayers through bonds. But the law doesn’t extend that opportunity for fires in 2018, meaning that it wouldn’t apply to the Camp Fire. 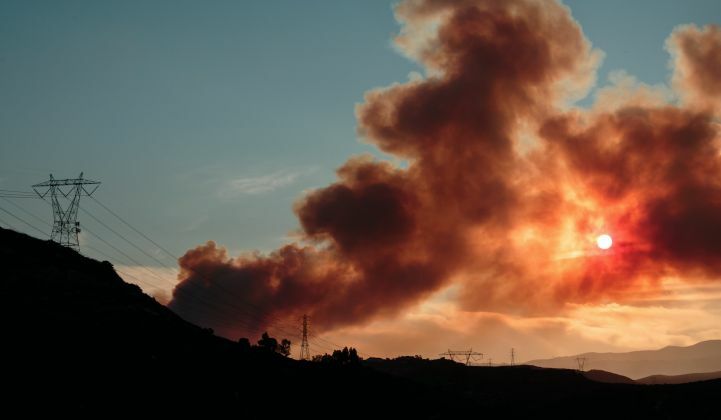 Although a legislative effort to extend the law’s coverage to 2018 fires was launched in November, the lawmaker behind the effort announced he was scrapping it last week, after PG&E notified the state it was planning to file for bankruptcy. PG&E went bankrupt in 2001 during the California energy crisis, and emerged from reorganization in 2003 with a settlement that allowed the utility to pass on about $7 billion in costs on to its customers through increased rates. But its current liabilities are much larger, and could increase customers’ bills by an average of 14 percent if they’re fully passed on to customers through securitization, according to an analysis by Credit Suisse. PG&E’s bankruptcy filing made clear that it will continue its operations, including fire prevention efforts. "Throughout this process, we are fully committed to enhancing our wildfire safety efforts, as well as helping restoration and rebuilding efforts across the communities impacted by the devastating Northern California wildfires," PG&E interim CEO John Simon said. These promises will likely come up in a Wednesday hearing where the federal court judge overseeing PG&E’s criminal probation for its role in causing the deadly 2010 San Bruno pipeline explosion will consider ordering PG&E to reinspect, repair and clear vegetation from the entirety of its 106,000 miles of transmission and distribution grid by the start of summer this year. PG&E has stated in recent court filings that such an effort would require hiring hundreds of thousands of workers and cost between $75 billion and $150 billion. PG&E may also seek to renegotiate many of its power-purchase agreements (PPAs) with older solar projects that sell power at far higher prices than today’s market rates — a move that could save the utility about $2.2 billion a year, according to Credit Suisse. Last week, NextEra Energy and Consolidated Edison, which sell PG&E solar power under PPAs that could be subject to renegotiation, asked the Federal Energy Regulatory Commission to use its authority to review any contract modifications to see if they’re in the public interest before they’re breached in bankruptcy. FERC responded with a Friday order saying it has “concurrent jurisdiction” with bankruptcy courts over these kinds of PPA renegotiations — a stance that’s not necessarily backed up by federal case law on the matter, as PG&E pointed out in its own filing asking FERC to reject NextEra’s petition. UPDATE: in Tuesday bankruptcy court filings, PG&E identified about $42 billion in power purchase agreements with 350 companies, representing 13,668 megawatts of contracted capacity, that it will ask for permission to renegotiate or abrogate. For more on the complexities surrounding PG&E’s bankruptcy and its effects on California’s clean energy and carbon reduction efforts, click here.